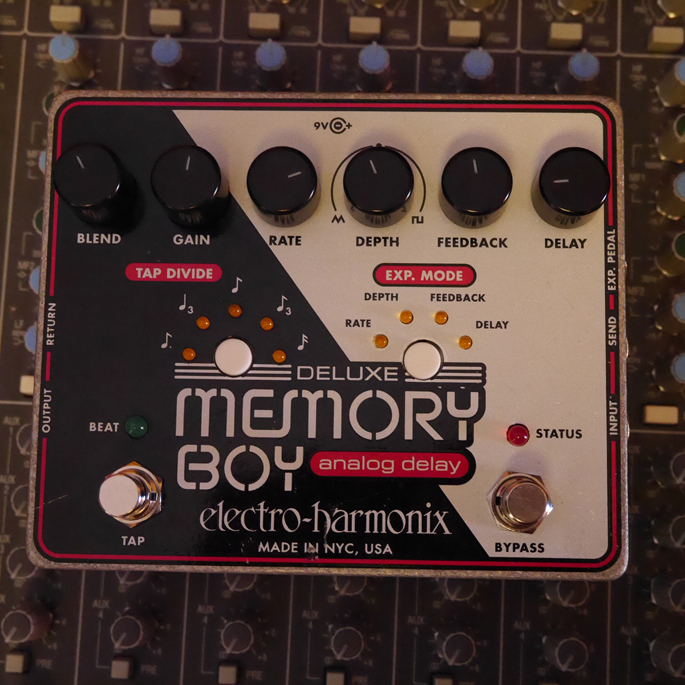 Deluxe Memory Boy, Delay/Echo/Phrase Sampler for Guitar from Electro-Harmonix in the Memory series. 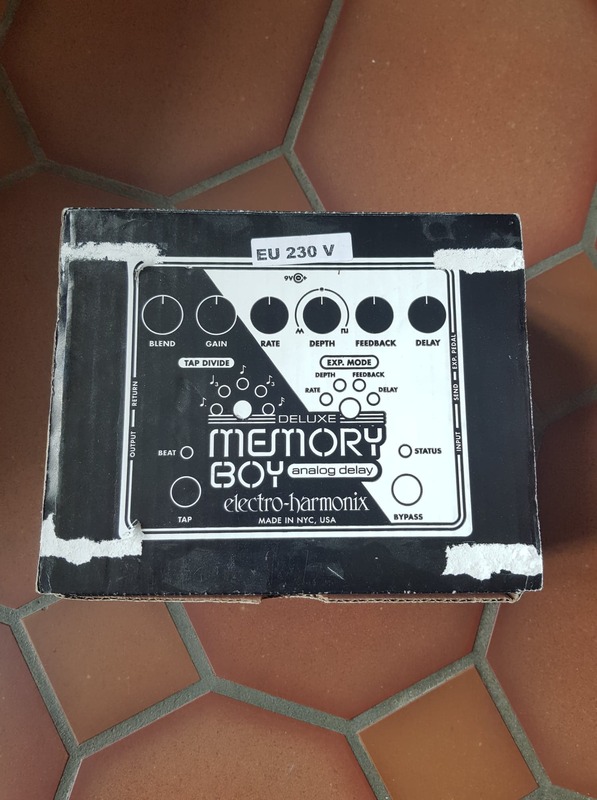 Electro-Harmonix Deluxe Memory Boy is a analog delay, you have six knobs on top Blend,Gain, Rate, Depth,Feedback and Delay its a good set of knobs to get creative with your sound, you also have the timing subdivisions on the left side name "tap divide" you get to choose 5 note divisions for the metronomic variances. In the mid right side you have "exp mode" to control with you expression pedal you can choose to control the rate, depth, feedback or delay. At the bottom you have the tap button to set your tap tempo and you have your bypass button to turn it on or off. The bypass button has a red light over it to let you know when its active and the tap button flashes green button pulsing the tempo. The use is very easy and basic, the knobs are accurate I had the pedal over 3 years now and have no problem with it, the tap tempo is always a plus not needing to bend over and control the rate. The pedal is solid made like a tank doesn't wear out. The manual is clear and easy to read which i didn't need to use because everything on the pedal is common sense. 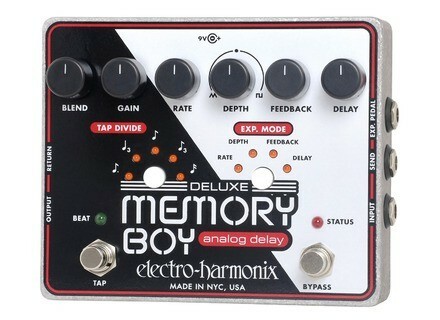 I use this with my fender tele, and the reason I bought this pedal is I needed a analog delay which would be softer compare to my Eventide time factor Delay which is a digital straight in your face type of delay, I actually mix in the two delays together when i feel creative, but for the most part I keep my memory boy blended in the back to give that atmosphere you can always bring up the the blend and the gain to throw it up in your face but analog delays are always a bit warmer and softer, its a good standard for delays. 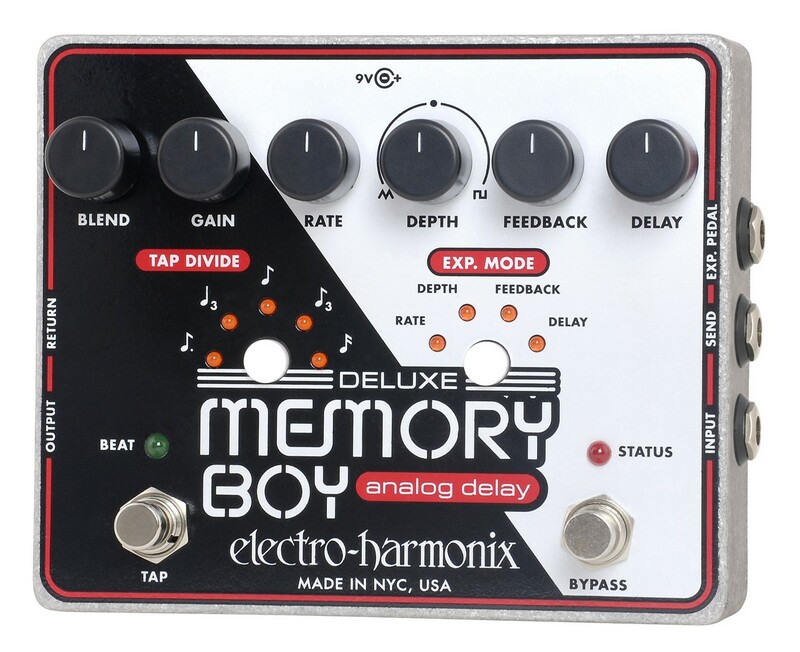 I suggest having analog and digital delay and memory boy does the job for me, I got the pedal used for $120 i believe and that is worth the money hands down, if the pedal broke down on me ,which i doubt it it, i would definitely replace is with a new one. I think the pedal is excellent for the analog delay. The sound is beautiful super soft and warm you can combine it with many other pedals and the memory boy won't get in the way, the sound is its best trait very clean and soft, thats the reason i fell in love with analog pedals, i tested a lot of other delay pedals like all the boss delays strymon delays …etc and for the price i couldn't beat this one , so i hear its a love or hate thing, i think it comes down to what type of delay you want digital? analog? and what will it be used for, like i said i mainly use it for soft background delay to create a ecosystem in the sound and that works very well. psantoni's review (This content has been automatically translated from French)" A good delay, BUT! (Synth use, bar ...)"
I will not repeat the comprehensive features of this pedal. Only the absence of an ON / OFF button is a bit heavy. 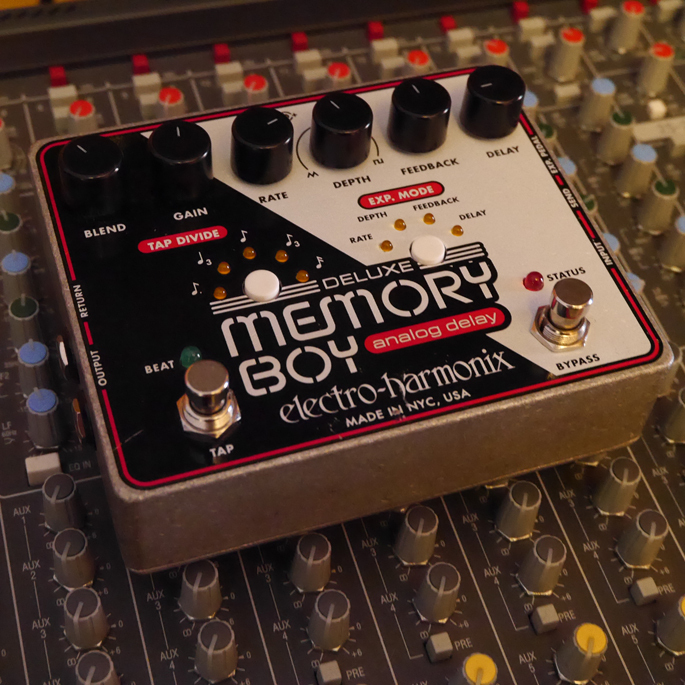 BBD chip integrated into this pedal is a modern apartment low-cost version of the BBD chip Delux Memory Man resulting in impaired sound quality compared to its older brother. Configuration and ease of use, manual very clear. A pleasure to use, however it must balance the gain according to the type of instrument input. The pedal is clearly designed for guitars. Indeed to compensate for the quality of the BBD chip, HEX placed a low pass filter to smooth out the overall sound of the delay. The result is a bleak delay repeats which are deaf and altered. I use it mainly on my Microbrute coupled with my modular A-100 (the effects loop through the modular). Pedal excels sounds lying in the upper spectrum (Lead, keys ...), then rehearsals contrast very well with the original sound is the best! on the other hand, when the bottom of the spectrum is attacked is really ugly (boiled saturated and low inaudible). I use it for a month, this is my first analog delay. DMB is very attractive thanks to integration possibilities it offers (tap tempo, effects loop pedal voltage Eurorack consistent phrase ...). on the other hand, very dark confines of his rehearsals for use in the upper spectrum. To conclude I would say that the price / quality ratio is good, but it is a very particular delay to be used in awareness of its limitations. Seed Barrette's review (This content has been automatically translated from French)" Hment well!" So I am using the knob virtually no delay which is precisely adjust the time delay. Note that I have absolutely no breath contrary to what was said in another review, this tells me I have nothing that wanders inside my pedal and if that was the case, I n 'will not have wasted my time to disassemble, I will have returned as dry demanding an exchange rather than risking any or r ... but hey, I have nothing a hacker and I know nothing in electronics. I use it for one month and I love it since I plugged it in and heard for the first time. Immediately I knew she would not leave my set. Value for money given the honorable all-steel case that inspires confidence. I remake that choice is clear. Pi r's review (This content has been automatically translated from French)" Great sound, excellent connectivity"
Pedals of analog delay with tap tempo, 9V supplies. Editing effects comfortable, especially live, thanks to large potentiomtres, effective, and led diffrent, though blind. Note the connection: an effects loop, thanks to which it is possible to color the rptitions (eg with an octave. Possibility to use an expression pedals also. The manual is clear trs. The edition of the sounds is easy. The rglage gain is effective, the Dry / Wet mix too, SETTING THE rptition trs of hard progressive. It is easy to select the division of rptitions. I have not tried the pedals on the other hand. The rglage feedback should be sparingly (part quickly rptition infinite). It is the same for the modulation of the delay (less than look for analog sounds). The tap tempo could be more ractif. The delay effect is one of the finest I know. It gets dirty, but it's warm and musical. I love it. It does not just rpter sound, but adds a touch of heat. My clean sound is enhanced my musical sounds trs. However, this is a matter of got I guess, because we are the opposite of the proposed numrique a delay (which I also possde). I use it with several guitars, amps in Varis, with the same pleasure. I use extensively the delay "simple" and the frquemment rptitions infinite also, to produce sound effects. I use a little less modulation, which gives fast things inaudibles.A small dose is good though. I tried many MODELS: DD3, DD7, space echo, carbon copy, emress super delay ... But I wanted an analog delay (or sounding like a numrique analog), with tap tempo, if possible without food in 9V power supply SPECIFICATIONS. 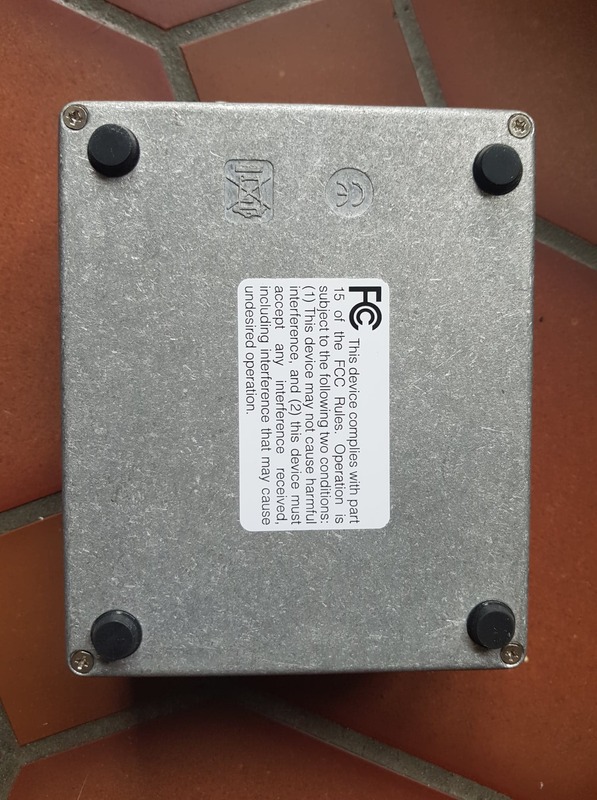 I prfre is its sound, but also its relative compactness and the fact that we can supply it with power supply "normal" (not too big not ncessitant intensity. It happens in my little pdalier, food with a "big john" the shot. I also like his price, trs reasonable. I like less modulations (I would spend if it rduisait even its size. Trs good value quality price.